“IF YOU want to, I mean, really want to earn a million dollars – This is the best and fastest way to do it.” That’s what the Millionaire Maker promises you. So what is the Millionaire Maker and how does it turn you into a millionaire? 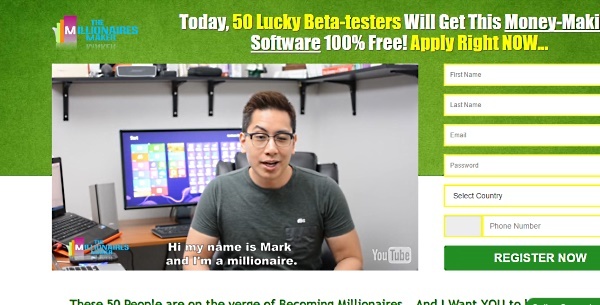 And… Is Millionaire Maker scam or legit? Make sure you read the detailed review below before you hurry to sign up for them. 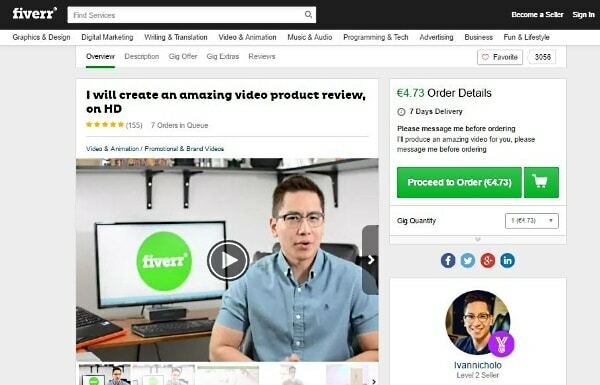 Better ALTERNATIVE to the My Millionaire Maker scam that will help you make $1200+ a month online. And these testimonials are proof. Why not give a whirl right now? This is laughable. Well, no, it is not. But it would be if the scheme were not shamelessly ripping off innocent people. The truth is, in the case of the Millionaire Maker, they tell you nothing about themselves. There’s no narrative, no story behind the product, no nothing. Who created it? How it was created? Why it is superior to other similar products? All these questions remain unanswered. They tell you nothing. Weird! Can you imagine… That’s all he tells about himself, or about the background of his Millionaire Maker wonder-product. In the past he called himself Todd Salerno. Now he is Martin… Martin who? Mhm… They don’t give you much factual information, do you agree? Will you trust your savings into their hands? Is Binary Options Trading Safe? They make it plain clear, don’t they? In recent years, Binary Options have become hugely popular indeed. Mostly because from the outside it seems to be an easy trading opportunity. After all, every time you trade, you have only two options to choose from and that’s it. You either win or lose. Not only that. Because Binary Options deal with fixed amounts of money, you already know beforehand how much you can win (if you wage correctly). If you happen to wage and lose, though, you only lose a fixed amount. Even better, ever increasing number of Binary Options tradings robots keep popping out like mushrooms after the rain. Most of them (if not all) offer Full Autopilot, which means that the software does all the trading for you. For the Average Joe, though, it leaves a false impression as if Binary Options is a real make-money-online opportunity. See! Binary Options are NOT “dream-come-true” or “get quick rich online” opportunity. It involves an extremely high degree of risk and you should be financially able to lose all your investment. Not only that. You also must have knowledge in trading, assets, and markets. Remember, Binary Options are NOT an “easy button” that just spits money out at will. Even worse, because there is such a tremendous interest in Binary Options trading, it has become a huge honey trap as well. You can find tons and tons and tons of Binary Options trading robots that are nothing but wicked scams – designed to free you from your hard earned savings. And, as I am going to prove it to you in a minute, The Millionaire Maker is one of them – a wicked scam, designed right from the beginning to take away all you have. How Will Binary Options Gangsters Rob You? First, Binary Options software – This is the software (or trading robot) that you use for trading. The Millionaire Maker Software belongs here. In most cases, this piece of software is given to you for free. You can find legit software and even more outright scams. Second, your trading account – this is where things get interesting. As I told before, in order to start trading binary options, you first need to open a trading account with some kind of broker. Then you must fund your account. You deposit your initial investment to your account. In most cases, the required minimum is $250. This is YOUR real money. And this is the money you use for trading. You can make profits (if you wage correctly) and you can lose it. What about brokers, you ask. There are two different type of brokers – regulated and unregulated ones. Regulated Binary brokers are the legit ones. They hold a valid regulation licence from a regulation authority, allow you to withdraw your deposits whenever you want, etc. Unregulated Binary brokers are shady companies from some offshore countries. They lock your deposits and you won’t be able to withdraw your money. Even worse, you won’t be able to file a complaint to a regulation authority either – because, as their name says, they are unregulated. And that’s where it gets ugly for you. If the Binary Options trading software happens to be a scam, they link your trading account to an unregulated broker. That means, you should consider every single deposit to your brokerage account as lost. Remember, they will make money when you lose it. First, they prey on beginners while appearing like angels. However, once you have signed up and given them your phone number, they use every trick in their tool bag to make you invest bigger and bigger sums and surrender your credit card details as well. Finally, after they have caused you to lose all your money, the scammers (the owners of the scam software) share the loot with the unregulated brokers while you are left victimized. As I already proved above, it is just not true. Binary Options are very speculative and highly risky and clearly not for the ordinary people from the street. If you want to learn how to make some side money online, here’s much better and safer option (even if you are a complete newbie). See here now! The promotional video found in the Millionaires Maker website includes 5 testimonials (3 in the beginning and 2 in the end). All five testimonials are fabricated and played by paid actors. See! Even the laptop and computer in the background are the same. It’s funny (in fact, it’s not), how people when they have sold their soul and integrity for few bucks, keep doing it again and again and again. So sad! However, what that means for you is the fact that there are no genuine testimonials on the Millionaire Maker app. Only lies, lies, miserable lies. The promotional video in the Millionaires Maker website gives 4 rapid success stories – of Sam Cook, Tim Grittani, Joshua Sason, and Jack Macdonald. These 4 impressive stories should prove that by trading Binary Options it is possible to become a millionaire in a fast past indeed. However, one of the very first of the four turned out a scam itself. The other four stories were genuine but had nothing to do with trading Binary Options. 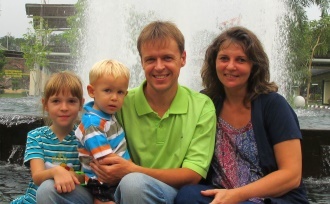 None of these 3 people mentioned in the video became millionaires by trading Binary Options. Therefore, in our case, their success stories prove NOTHING! As you can see from the image below, the Millionaire Maker Youtube page has barely 5000 views since July 15, 2015. And since that date they are still looking for the 50 lucky beta-testers? The offer should give you an impression as if you can easily miss your once-in-a-lifetime opportunity. Therefore, you must act at once. However, as I wrote above, this headline is deliberately designed to give you false sense of urgency. Because there are no beta testers, no 50 vacant seats, no nothing. The Millionaire Maker app was available for free in 2015, 2016, and it is free in 2017 as well. Don’t get fooled. There are tons and tons of similar Binary Options scams. I have reviewed many of them – Obcasio, The Millionaire BluePrint, Altronix, Tauribot, Citidel, Centument, the Profits Unlimited, the Profit Maker, to name but few. I don’t like the product at all. And mostly because they tell you nothing. NOTHING! They give you ZERO proofs that their software works. The only thing they give you is a 16 minutes sales pitch. Disgusting! Verdict: The Millionaire Maker is a scam!!! If you don’t want to get mugged, stay clear of it. Now that you have read my review, what are your thoughts on it? 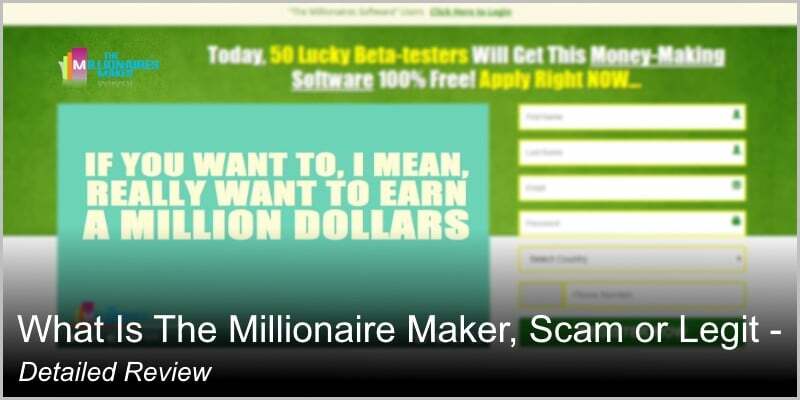 What Is The Millionaire Maker, Scam or Legit? Do you have any experience (good or bad) with the product that you want to share, please leave a comment into the comment section below. Interested review of The Millionaire Maker. I have been scammed twice of something similar to that Binary program because I was clueless about the online world and business. I have learnt my lesson differently. I have learned that people will do anything to scam others online of their hard earn money and for that, I’m extra careful. Anyway, I will check out your reccommended program so that I can educate myself. Hi Kacie and thank you for the feedback. I have been scammed too (not by binary options but a “get quick rich” scheme anyway). And, to tell the truth, the reason why got hooked was the same – I too was completely clueless about making money online. That unfortunate event did not stop me though. Quite the opposite, I decided to commit myself to learn on how I can make legit income online. Then, in one lucky day I found Wealthy Affiliate – the internet marketing training platform and community that I am using until today. In fact, I am very satisfied with it and it’s the KEY to every shred of success I’ve attained. That’s why I sincerely recommend it to everyone. Feel free to check it out, Kacie. You will like it, I can tell you that. Such a helpful page you have. I hope people that want to go into type of money making business learn to verify first trough reviews and/ pages like this. By the way, do you have any site to recommend which could be considered legit and why? Hi, Rock, and thank you for the feedback. Also, thank you for the kind words, I appreciate it a lot, sir. I keep combating all those “get quick rich” online scams and writing these reviews to protect innocent victims from falling into those ugly traps. The problem is that scammers know human psychology, how to hook and then rip off unaware people and they are using every dirty trick in their tool box to achieve that. And that’s why it is so awfully easy to fall victim to these frauds. 1. WA training is suitable even for complete newbies. 2. You can start for free (no credit card required). No obligations. 3. WA training and its certification courses are very easy to follow and extremely practical. All you learn you put into practice. That way you will grow very fast. 4. WA support is simply excellent. Very fast. I am very satisfied with their service.